Looking for a short term place to store your cash? Placing your money into a certificate of deposit will earn you more than most bank savings accounts. By putting your money into a 6 month CD, you not only earn more than the average savings account, but you also don’t have to wait too long before you have access to that cash again. Short term CDs are a great way to earn a quick few bucks while you wait to make that purchase or if you are waiting to use that cash. I recently placed my money into a 6 month CD because I knew I could earn more than leaving it in a savings account, but also wanted the ability to use my money in the next 6 months to buy a house. Right now isn’t a good time to buy a house, so my money was just sitting in my bank account collecting dust, or a few pennies from its extremely low and offensive interest rate. Walden Savings Bank has been around for over 135 years and has always provided some of the best CD rates to its customers. Walden is currently offering its six month CD rate at 0.75% APY, with a minimum deposit of only $1,000. This CD will automatically renew at the end of its term so its important that you let the bank know your intentions during that time, otherwise you might get stuck in another 6 month term. There are penalties for early withdrawals so be sure you read the fine print. Walden Savings Bank is headquartered in Montgomery, New York and is a federal chartered mutual savings bank that opened in 1872. 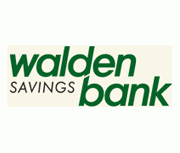 Walden Savings Bank maintains 11 full service branches in southeastern New York (Walden, Washingtonville, Montgomery, Cornwall-on-Hudson, Pine Bush, New Windsor, Gardiner, Scotts Corners, Circleville, Middlehope and Florida). You will want to visit one of their branches to learn more about their savings and other options offered. Be sure to check out our most up to date CD rates table to find the best rates for any CD term.